Today’s update is the second part of a double post that aims at filling you in with some details of my life here. This part is the more academic part about conferences; the other part you can find here. As always, comments are welcome on all kinds of platforms. Conference. That is the key-word of this update. An English word originating from Latin con-ferre ‘together-bring’ (read: ‘bring together’), passing through French. Well we are talking about academic conferences here, ‘cause I just started doing that. Of course I had done presentations for friends, maybe foes, classmates etc. but I never really attended a conference before. 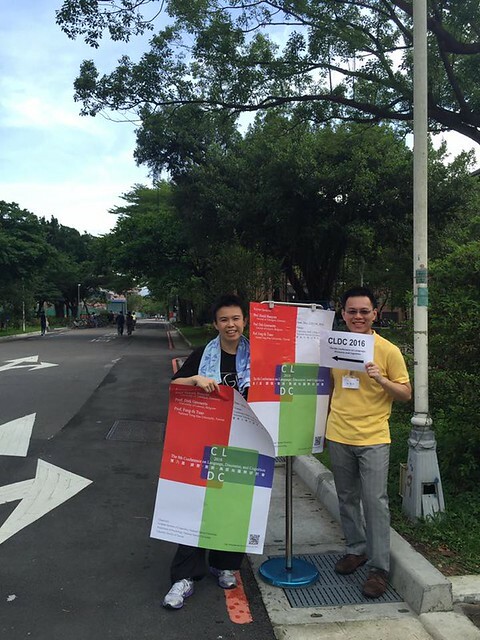 This is in contrast to one of the requirements of the master’s programme here at the GIL of NTU, viz. you have to attend an international conference (it’s not a requirement of the PhD programme; however, it’s strongly advised). In Belgium this was kind of impossible or at least impractical because most masters in the humanities are only one year long. So it was kind of exciting for me when I decided to submit proposals in order to go speak at a conference this year. That’s why I will try to describe the process I went through this year. You have to subscribe ‘social networks’ for the field you are in. In my case that is mostly Linguistlist. Or at least you have to know about it, so you can check vacancies and other interesting stuff regularly. You become a member of certain ‘clubs’ — if that is the right word to put it. 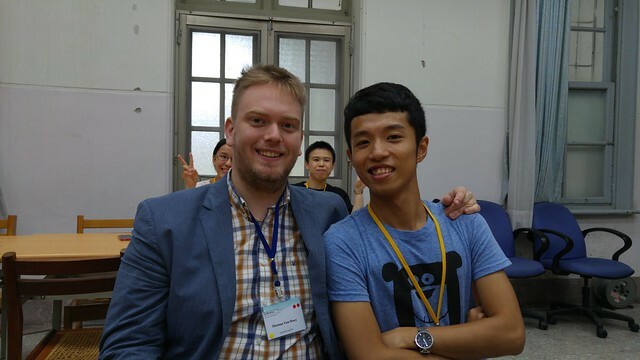 For instance, I am a (student) member of the alumni organisation Sinalumni for ex-sinology students, the European Association for Chinese Studies (EACS), and more recently the International Cognitive Linguistics Association (ICLA) for which I was kind of convinced by my previous teacher Dirk Geeraerts. There’s many more where those came from (internet) and it’s a good way to stay updated. You get updates from your department. In this case, our dear Mei-Ling sends us regular updates on interesting talks (my department hosts many) and interesting conferences. Luck. Yes, you have to have a wee bit of luck. Maybe it’s a poster you see somewhere, maybe it’s a LinkedIn post, a facebook link, something someone tells you about, a random string of letters you type into google… Who knows. Anyway, in my cases it was mostly LinguistList and the department that told me. After you found a conference, you will want to submit a proposal; at least, if your aim is to be super actively involved there. If you want to attend (and mingle with some people), that is also okay of course. I wrote my first submissions around December 2015 and got answers pretty soon after that. I submitted for CLDC 8 (see below), a summer school in Leiden (see future blog post) and a symposium in Berlin (see future blog post). And then I got notified that I got accepted, which I was thrilled about. As a warm-up and given my non-existing prior experience with conferences, I decided to attend one so I could see how the show rolls. 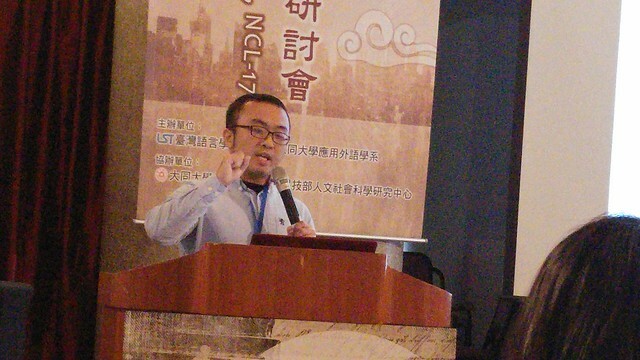 I went to NCL 17, the (Taiwanese) National Conference on Linguistics. 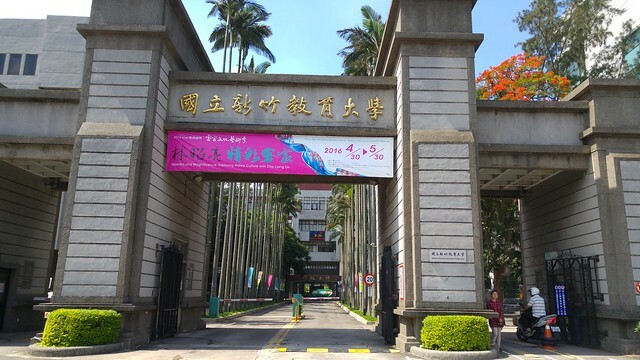 It was hosted at Tatung University 大同大學. 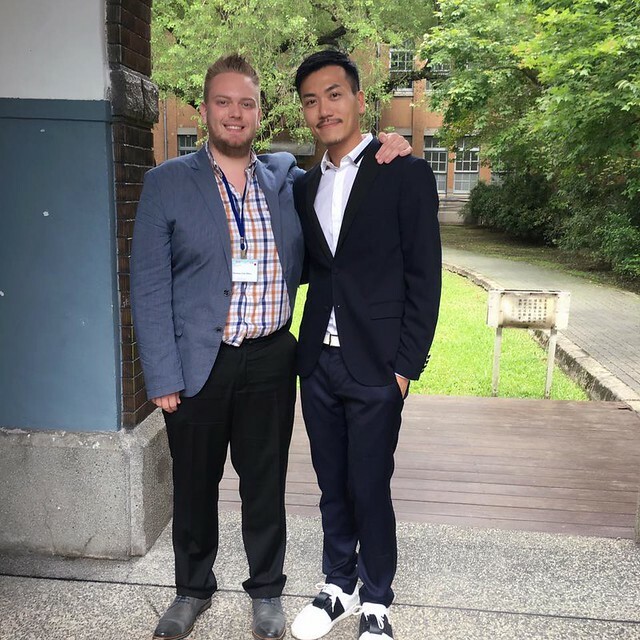 It was very interesting to see; especially because I got to see my senpai 學長 Chester present a paper he had been writing last semester, as well as to see my supervisor Lu Chiarung and my other teachers be present and just in general show my face. 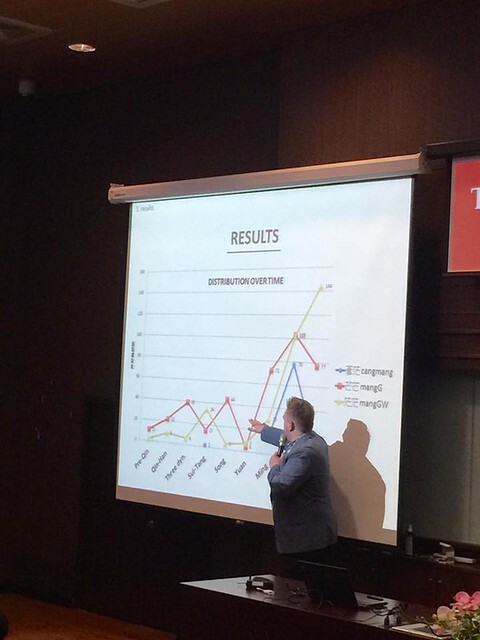 This is the main part of this post, as it is the first conference I spoke at. 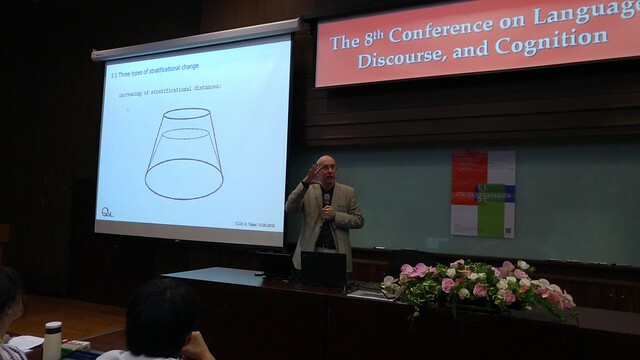 CLDC, the Conference on Language, Discourse, and Cognition is a biennial conference organised by my university NTU. 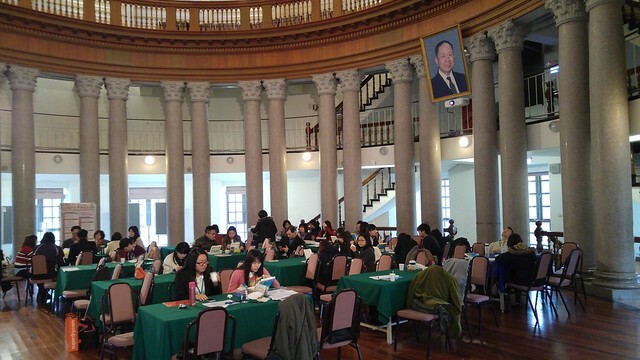 It originated from a smaller set of discussions and has grown out to be a bigger conference that welcomes both Taiwanese as well as foreign talks. While the conference itself was held from 13 to 14 May, the first pre-session by keynote speaker Harald Baayen happened a day earlier, when he showed us the wondrous world of R — that’s a computer programme for statistics, for those who R ignorant of this fact (note: in Dutch I would have said that “je geen R-varing hebt”). Professor Baayen is very famous in computational linguistics and his talk was interesting; the subsequent hands-on session was more difficult to follow though. The next day we had our first set of presentations, you can find the conference programme here. In the morning my previous teacher, Professor Dirk Geeraerts from KU Leuven gave a talk on onomasiological variation and lectometry, especially with regard to the lexical field of clothing terms in Flanders vs. the Netherlands. 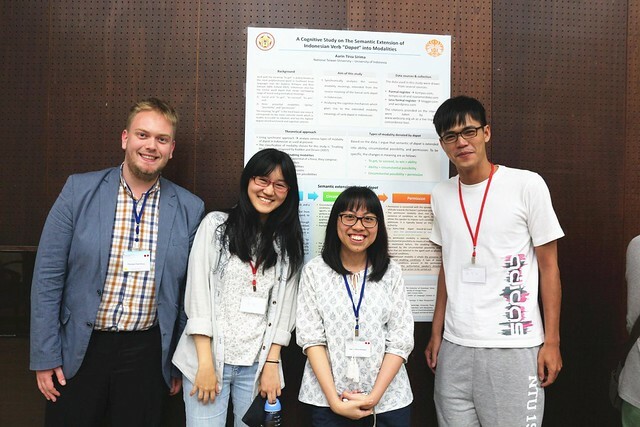 The rest of the day was filled with very interesting presentations and a poster session for which some of my classmates had submitted a proposal, e.g. Aarin about the dapat ‘to get’ in Indonesian. At night there was a banquet, where I finally got to eat dryish spaghetti — as opposed to the variant that is too moist that is served ubiquitously here. 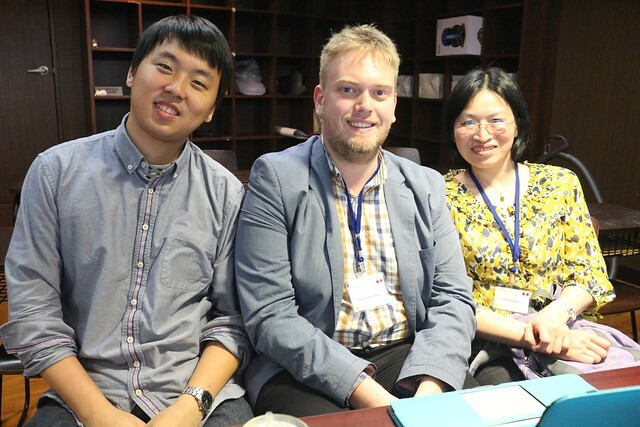 And, I got to sit at the table with the ‘grown-ups’ (read: with the professors), talking in Dutch and English and Chinese with friendly people. 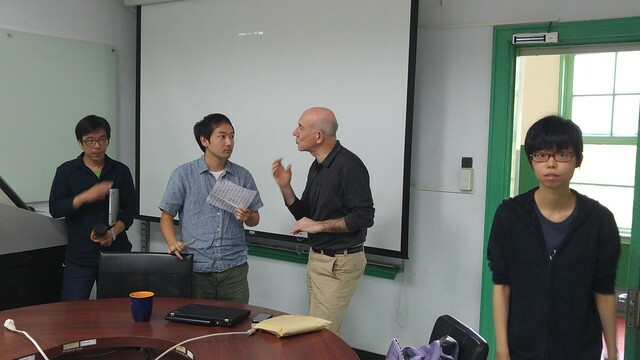 The very next day it was my turn to deliver my speech that I had prepared together with my supervisor. 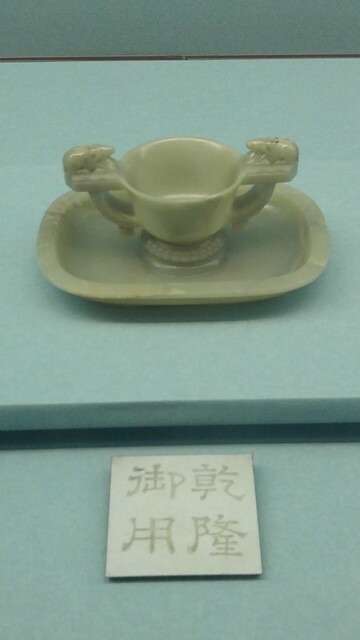 It was entitled “The distribution of ideophones in Tang poems: A variatonist perspective”. 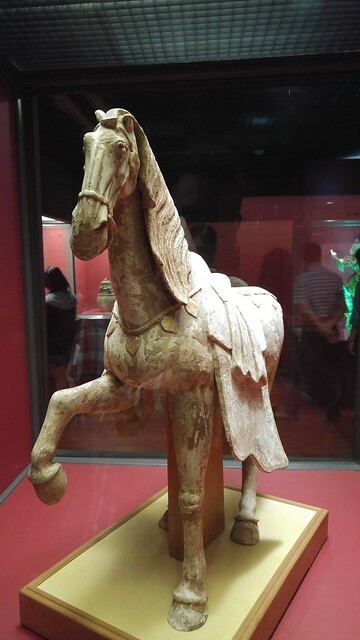 In short, I summarized findings from my MA thesis last year as a corpus-driven approach to look at three variations mangmang 茫茫, mangmang 芒芒 and cangmang 蒼茫 in a corpus-based way. Turns out that while all three depict ‘wide, open, vast’, the ones with the water radical (the two falling and one raising stripes at the left side) occurred in different places and different times closer to water than the one with only grass (that’s the second one with the two plus signs (++) at the top). It was a good pilot study and I am happy to announce that we will try to publish it in the future! That was followed by another host of interesting presentations. I think my favourite one was the one right behind me, by Hsin-Yen who talked about iconicity in paintings. 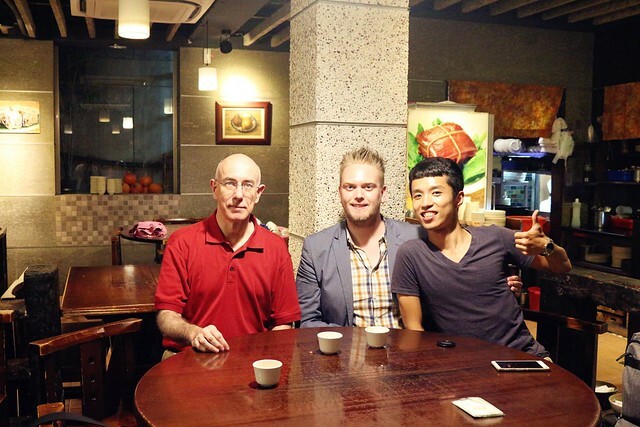 Later that night we went for tea shopping with our esteemed guests from the low countries and I had dinner with Prof. Geeraerts and Po-Wei. 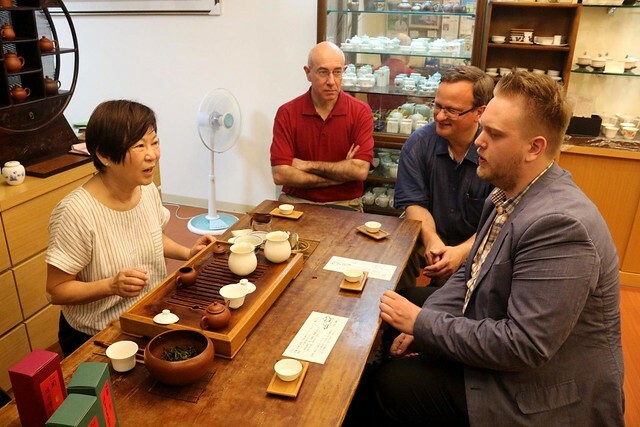 During the tea tasting I had a really funny yet embarrassing story that I want to share with you. 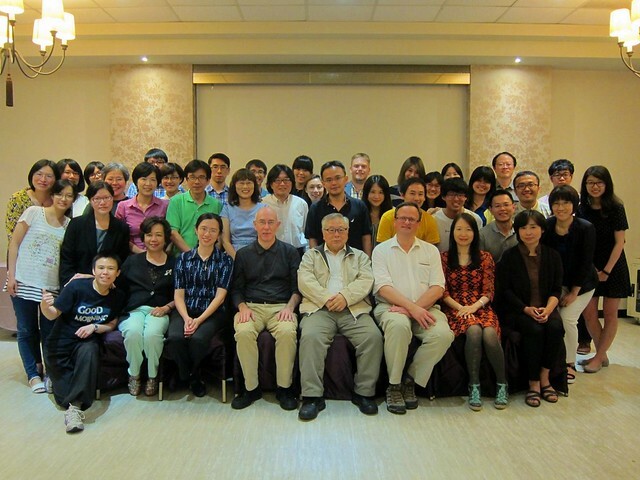 First we were helped by a very old man, who turned out to be about 85 years old. At one point he left to take a rest and the woman in the picture above helped us further out. I asked her if the old man was her father (fuqin 父親), to which she mumbled something back that I understood as agong 阿公, the Taiwanese Mandarin variant for ‘grandfather’. So, to be certain, I repeated the question, and she was like “no, no, my laogong 老公 ‘husband’. Turned out she was 65 years old. Will I ever be able to guess the age of my Asian friends?? However, it wasn’t the only time I would see Po-Wei that night as it was also the grand finale of the Eurovision Song Contest (Eurosong for the Dutch speaking friends). 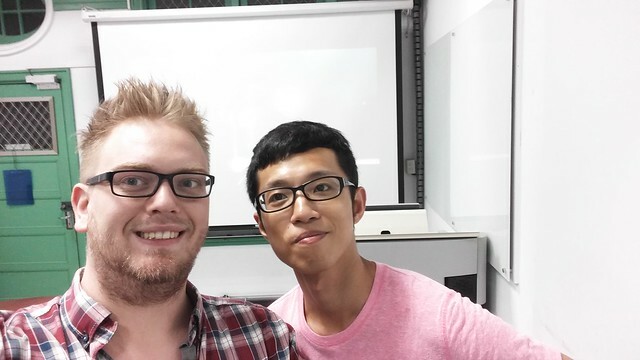 Ever since the beginning of this academic year it has been clear that he is a super fan and I am happy that we could arrange to watch the competition on big screen in our department, even if it was only the two of us who watched, starting at 3 AM. This, by the way, is not the first time I watched this ‘late’ [I like to watch this live], as I had done the same with Joke in Suzhou two years before. 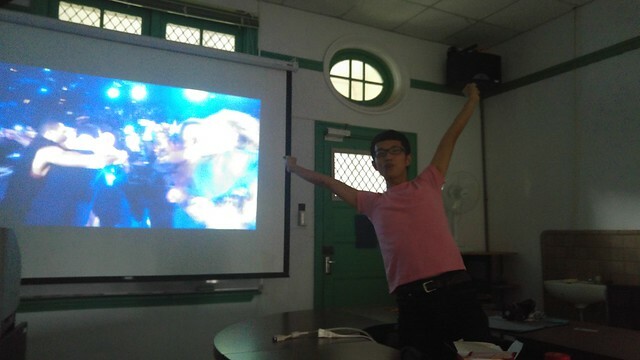 Anyways, Po-Wei was ecstatic when his favourite contestant, Ukraine’s Jamala with 1944, won the contest. Of course, the real winners that night were presenters Måns Zelmerlöw and Petra Mede who performed what they thought to be the “perfect Eurovision song”. Of course, it was an act that would have been disqualified in the real competition — having more than six people on stage and going easily over the maximum duration of 3 minutes. So, naturally I almost didn’t sleep (2 hours in total) and I didn’t get a chance to catch up. 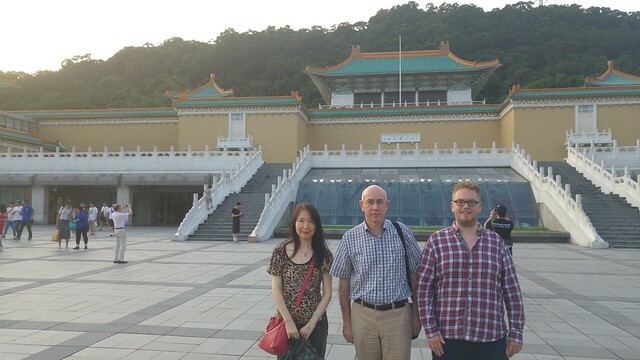 The next day I guided Prof. Geeraerts and Prof. Chiang Wen-yu in the Palace Museum (see this blog post for more information) and I humbly displayed all the sinological knowledge that is still stored in my head. Fun times, but even conferences have to come to an end. Or maybe especially conferences have to come to an end. Anyway, the next day there was a post-conference talk by Prof. Geeraerts on clothing terms (again…) and onomasiological salience and entrenchment, which was very interesting. Here is a picture of him talking with my Japanese friend Saito. This was followed by a lunch and that was that; but it’s not that for this update! 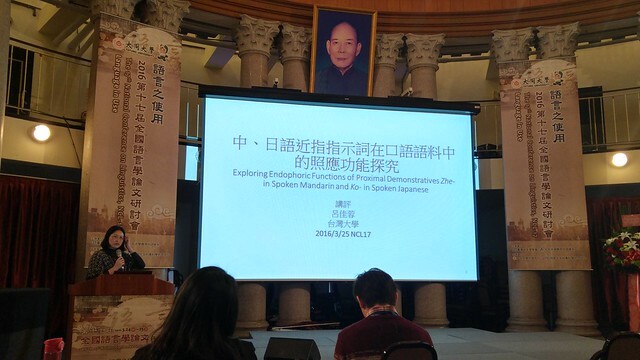 Last weekend I went to the International Symposium on Chinese Languages and Linguistics, which was held in Hsinchu. 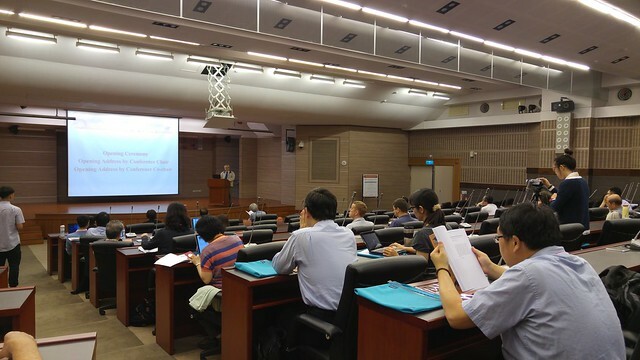 It was very interesting, with highlights on the first day in the second session. But of course, the real attractions were keynote speakers Randy LaPolla, a big name in Asian linguistics, and Adele Goldberg, one of the big names in Construction Grammar. Apart from these two, it was a good opportunity to network and I made new friends, e.g. 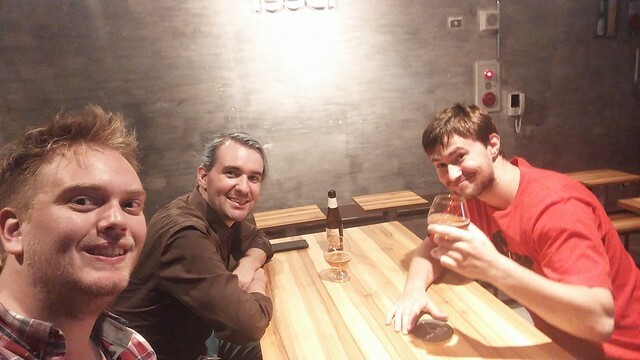 three graduate students; with two of them I went to a bar with Belgian beer later. 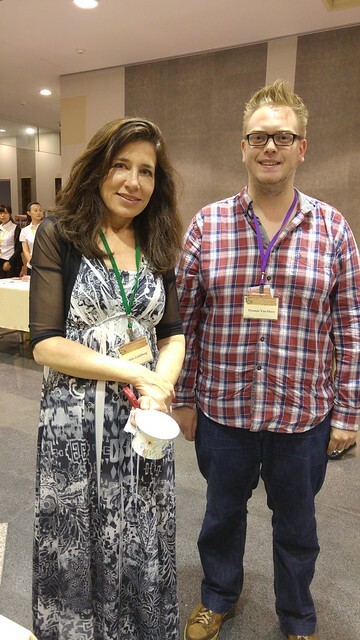 I also bumped into some big names in Formosan linguistics (the native languages of Taiwan): Elisabeth Zeitoun and fellow Belgian Rik De Busser. So that was it for this update, which ends considerably on a happier note than the previous one. 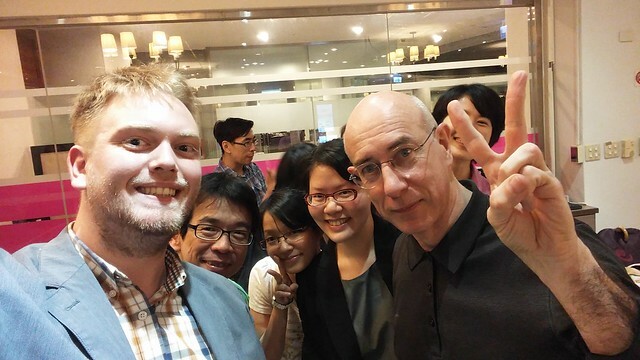 I hope to see you next time my dear reading friends!